Cambridge Analytica are, in fact, unlikely to have psychological data on more than a few percent of American voters. Practically it’s difficult to collect psychological data on people at scale. While quite a lot of us have taken psychological tests online, most of them aren’t robust. One of the most respected tests online, cited as an inspiration for Cambridge Analytica, tells me that I’m probably single. On the basis of my love for Stevie Wonder. Which will come as a surprise to my Stevie Wonder-loving fiancee. And it’s not possible to just harvest this information (without permission) from what you or I say on Facebook. The vast majority of people restrict their Facebook activities so that only their friends can see them. Even if you could collect the data, there’s not much evidence that it would be usable or useful. 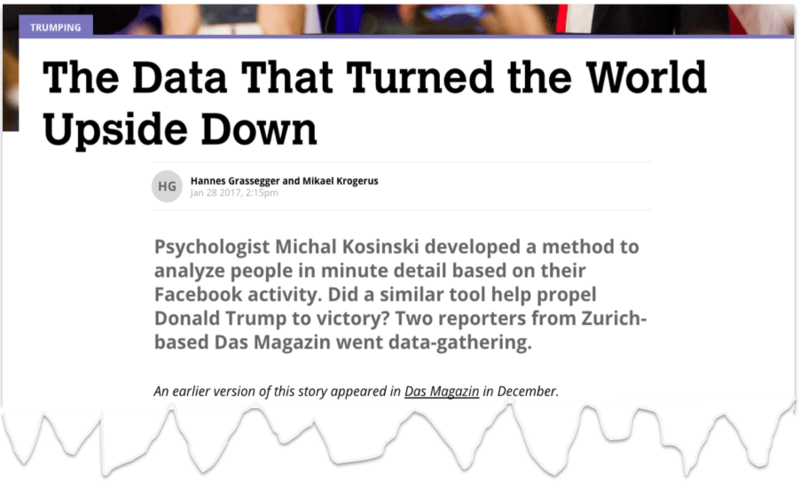 Cambridge Analytica themselves say that ‘psychographics was hardly used at all’ in Trump’s campaign. Which is odd when they cite ‘psychographic profiling’ as one of their key techniques, citing the OCEAN (Openess, Conscientiousness, Extraversion, Agreeableness, Neuroticism) model. What they appear to have done is to segment the American electorate into a large number of groups with similar psychological traits. They then influenced them with carefully tested advertising. In other words they extrapolated from a relatively small number of people to larger groups. For instance if they identified that men worried about jobs in Ohio, who traditionally voted Democrat but were open to Trump, over-indexed as Conscientious, then they could target advertising at them stressing Trump’s hard work and business skills. This type segmentation is used by some of the most sophisticated corporate advertisers. Did this work? And was it impactful enough to swing the election? Luckily Cambridge Analytica’s own website gives us some clues. Combined with public information we can make a judgement. It is extremely difficult to prove that anything changes people’s votes for a simple reason. Voting is secret. So we can’t know how any individual voted. What do they say? Did they change their voting intention after seeing a Trump advert? It’s possible to poll identical people before and after an intervention and see what changes, and to compare this to a control group so that we can filter out things happening in the outside world like a Presidential debate. What do they do before the election? Do people who see Trump advertising exhibit behaviours that reasonably indicate they are voting for Trump? For instance on Facebook they might share a ‘I’m voting for Trump’ picture. What do they do when they can vote? Does their turnout increase in the election? For instance 100 voters exposed to an advert might see their turnout increase from 50% to 60%, while a control group didn’t see this increase in turnout. Turnout data, at individual level, is widely available, and routinely used to assess impact of election campaigns. For instance we know that 6% of people who claimed to have voted in the 2015 election, didn’t actually vote when academics checked. What do they say? The website reports a ‘3% average favorability increase’ towards Donald Trump, presumably after seeing an advert delivered by Cambridge Analytica. What do they do when they can vote? ‘2% increase in voters submitting early ballots’. These are America’s equivalent of postal votes. Are these numbers enough to swing the election? The favourability number is the most important. A good piece of advertising should swing some people to change their vote. Favourability isn’t the same as voting for somebody though. Not everyone who is more favourable to Donald Trump will vote for him. Many people who become more favourable won’t vote. Some of these people will also have been favourable to Clinton. Some people would have voted for him anyway even if they started out unfavourable. The effects of political advertising are also well known to wear off, so this won’t be a permanent effect. In other words seeing an advert in August won’t have a large impact in your behaviour in November. So let’s assume Cambridge Analytica are targeting brilliantly, and half of this group actually does change their vote from Clinton to Trump. That means, among people who see Cambridge Analytica adverts, their likelihood to vote Trump increases 1.5%. Here’s the challenge though. That 1.5% is restricted to people who both use the internet regularly,say 75% of swing state voters, and who are persuadable in the first place, roughly one third of swing state voters. So that 1.5% can, at most, only influence 25% of voters (75% * 33%). Multiply these together and this 1.5% increase only changes the minds of 0.3% of voters. That’s enough to deliver any state with a margin of less than 0.6% at best, because each vote swinging from Clinton to Trump cuts her margin by two votes. This would have swung Michigan. Influential but not enough to swing the election. What about those other impacts though? Well if you assume that 40% of votes were early and that Trump benefited roughly evenly with Clinton, then an extra 2% of the early vote would have made up just under 0.8% of the vote for Trump. In 2016 early voting seems relatively biased to Clinton, so this is a very favourable assumption for Cambridge Analytica. This would have swung Michigan, Pennsylvania and Wisconsin. That’s enough to swing the election. Except for one thing. Pennsylvania and Michigan have virtually no early voting. So, again, influential, but not enough to swing the election. And fundraising? Well raising $26.5m from 950,000 email addresses over a few months is a relatively good performance. But it’s less than 3% of spending that backed Trump in the 2016 election, so unlikely to be pivotal. What about their other claimed victory, Leave in the EU Referendum? Evidence is more limited – Leave’s Campaign Director didn’t even mention Cambridge Analytica in his recent write up of the EU Referendum campaign. However a useful data point is that the Remain campaign won the referendum on the sample of postal votes that the BBC recently published – despite losing overall. Postal voters are a good test of organisation. Because postal voters always have dramatically higher turnout than other voters, all parties invest substantial resources in postal votes campaigns. A well targeted campaign will successfully sign up its supporters for postal votes, persuades them to use their vote. Losing the postal vote in the EU referendum campaign indicates that micro-targeting was not particularly efficient. So did Cambridge Analytica win the election for Trump? Probably not. Should the Democrats, and British progressives, be learning from them? Definitely.